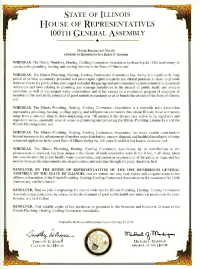 The Illinois Plumbing, Heating, Cooling Contractors Association is a professional trade association now in its 125th year of serving the needs of p-h-c professionals in Illinois. Through a commitment to excellence, our Plumbing-Heating-Cooling Contractors strive to protect the environment, health, welfare, and safety of the residents of Illinois. Joining PHCC will network you with other industry professionals who have common issues and needs. Our members range from very small shops to some of the largest contractors in the country. PHCC membership will provide you with education, information, communication, legislative representation in Springfield and on Capitol Hill, and much more. We hope you enjoy our website and find that it is useful tool. Please visit each section at your leisure to see the many things we have to offer. Check back often for the latest on industry events and news. Let us be THE resource for your professional needs.